Most of the people today are leaving Puerto Rico because of the hurricanes that have hit and caused a lot of damage to the land and the people. The hurricanes have injured and killed citizens. Another reason that Puerto Ricans left their country is because they wanted to get a better life, they wanted money, opportunity homes and a better future for their kids. 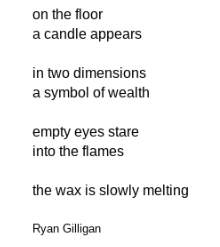 This is the other poem that I wrote. As I walk down the path I notice all the small things, the squirrels and chipmunks sprinting across the grass and up the trees, the leaves start to fall and the branches become bare like they are alone, my dogs favorite squeaky toy, outside, she would never put that toy outside, she loved it way too much. I knew something was wrong. I then stopped walking and I looked up at the wide open door, I threw my water bottle onto the floor and I ran, my cleats hit the ground even harder now making it sound like horses hooves. I didn’t even have to look, I knew she was gone. I am from the hospitals. The place where I visit so much. The place where I go home learning what to do and what not to do. The place where nervous faces surround me. I am from the hospitals. I am from the white sand beaches. The many barbeques that we had on those beaches. The seagulls calling out to us as if they had to say something. The seals lying on the rocks together. Friends and family laughing together. I am from the white sand beaches. I am from skiing. Gliding down the mountains, wind pushing against my face. Trees and frozen lakes surround me. I leave two trails behind me. Looking out over the mountains and the valleys as I ski. The skies are filled with snow and clouds. I am from skiing. I am from family dinners. Gathering around the table. Sharing our thoughts and troubles. Talking about anything we want. Knowing we are wanted and welcome. And sometimes we are quiet from eating. A place where not only good news is told, but also bad news. I am from family dinners. When I go back in time and think, I know where I’m from. I had done it. I looked up at four faces peering over the edge of the pier. They were my friends, my real friends. They didn’t look shocked and surprised. I remember when I had no hope that I was going to do it, but now I could walk up onto the pier and jump right off without thinking twice. I felt like I could do anything now. When I was younger I thought superglue and my fingers were a good match. It was one of the biggest mistakes I ever made. I was at basketball practice and our warm up was to run backwards. I learned something that day–do not run backwards with your laces untied. Once I stepped on a fly and thought it was a bee, so I ran around my house screaming. A couple of months back I was riding my bike down the road and I felt a huge bump under my tire. I looked back and saw a turtle. Once my cousin said to me that he believes in ghosts, so that night I banged on his wall and made ghost noises. In the morning he said he got no sleep. Once I ran into a glass door at the mall and the glass cracked everywhere. I love marshmallows that are completely burned. My dog tries to catch mice, and when she does, she eats them. I hate video games. I could pop bubble wrap for three hours straight and I wouldn’t get bored. People tell me that cracking knuckles can give you arthritis but I know that’s a lie. I find grating cheese extremely satisfying. I love dogs, but I hate cats I think. Cats are so boring. I have an addiction for jumping off things. I hate the smell of air freshener. I love to scrape the frosting off oreos and eat the frosting separately. I hate bananas.